SFBJ (Société Française de Fabrication de Bébés et Jouets; also referred to as SFBJ) was the last of the great French dollmaking companies. 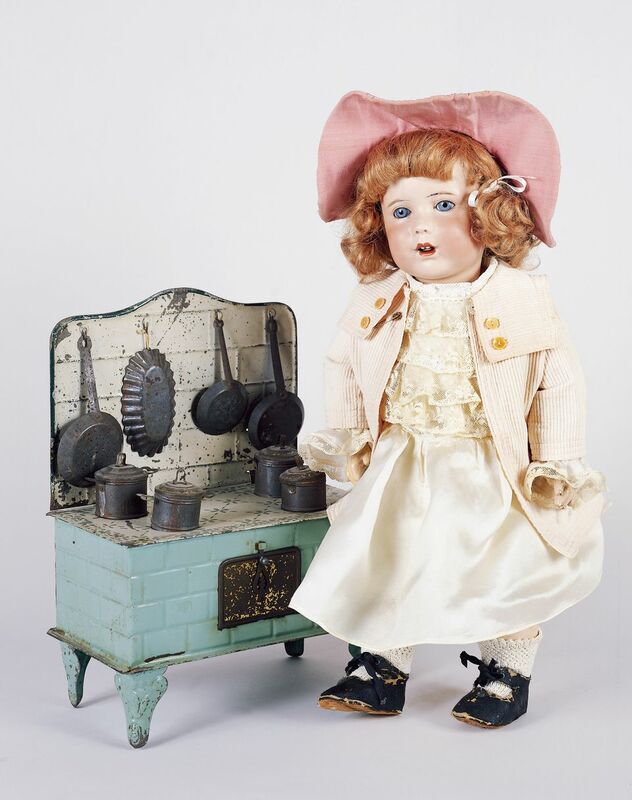 Formed at the nadir of French dollmaking at the end of the 19th Century, SFBJ made dolls until the early 1960s. Quality of the dolls varied greatly, from exquisite character dolls in the early 1900s, to souvenier dolls of painted bisque, composition and plastic in the mid 20th Century. In the very early 1900s, SFBJ kept the Jumeau name alive for dolls; besides these early "Jumeau" dolls, SFBJ is best known for Bluette, character dolls and their early dolls such as Eden Bebe. SFBj was formed in 1899 by the remnants of several legendary French dollmaking companies that were in financial difficulties due to severe competition from the German dollmaking firms. These companies included Jumeau (known as Jumeau et Cie by then), Bru, Rabery, Bebe de Paris, Gaultier, Pintel and Godschaux and others. In addition, the German doll distributor Salomon Fleischmann provided a factory and cost-cutting methods to the syndicate; Fleischmann was living in France at the time of the formation of SFBJ due to his marriage to a French woman. SFBJ was somewhat successful with their syndicated (and cheaper) production, and the company lasted for many years. SFBJ dolls were produced from 1899 until the early 1960s (although some sources claim that the company stopped production in the late 1950s and simply distributed the remainder of their inventory until the early 1960s). The vast majority of SFBJ dolls were made of bisque--bisque heads with composition bodies. Later, SFBJ dolls were made fully in composition and even later (1940s and 1950s) in hard plastic as well. SFBJ produced many character dolls, including lovely baby and toddler characters. Some of the 200 Series characters, such as the 233 (the Crying Child) and the 200 Series Character doll giftset with interchangeable 200-series character heads are quite rare, and very desirable today. Bluette is discussed at length in All About Bluette - An Introduction to Bluette Dolls. Bluetete is one of the most popular dolls that SFBJ made (under both their SFBJ and Unis, France labels). Bluette was the "Barbie doll" of her day--she was relatively inexpensive (about 11 inches tall) and she was made to teach children how to sew; there were also outfits made by SFBJ for her. There were thousands of patterns (over time) that became available to sew for Bluette. Bluette is very popular today with antique doll collectors that enjoy sewing, and her relatively high and stable prices on the market today reflect that. SFBJ's early dolls were really just Jumeau dolls released and produced under the new label. Therefore, if you have a sharp eye, you can find an early SFBJ that is relatively indistinguishable from some of the late Jumeau dolls. Collectors should be careful, however, since SFBJ dolls did vary quite greatly in quality due to the combination of companies and assets at the beginning of its history. SFBJ used several marks; dolls were often marked "SFBJ//301//Paris//9; or something similar, where SFBJ is the company identifier, 301 is the mold number and 9 is the size. Unis France was another mark that SDBJ used, from approximately 1916 through the 1930s. Some dolls, such as the 1907 Bebe, were only marked with the mold number. Prices for SFBJ dolls have held relatively steady as of the 2016 market. Their prices remain relatively firm or slightly increased for the rarest of character dolls, and although Bluette's prices are no longer on the rise, an early Bluette is still hard to find for under $1,500 (and the Premiere Bluette is much more expensive than that). The most common SFBJ Bebes (such as the 301) can be found at relatively low prices; even under $500--although, again, the quality of the workmanship on the doll will vary and prices will vary in conformity with the workmanship.